Many people mistakenly believe that grief is a single emotion, but normal grief is actually a powerful, multifaceted and often uncontrollable response that human beings experience following a personally painful or traumatic event, such as the death of a loved one. In other words, grief can affect us not only emotionally but also physically, mentally, and even spiritually. The loss of a loved one due to death plunges us unwillingly into a maelstrom of pain that often feels overwhelming and inescapable. During this time, common physical grief responses can include any of the following, individually or concurrently. Often connected with the disruption to our normal eating habits or routines, the bereaved often experience temporary problems with their digestive systems, such as constipation, diarrhea, stomach pain, a "hollow feeling" in the stomach, queasiness, or feeling nauseated. Sitting behind the wheel of a motor vehicle or riding a motorcycle requires tremendous concentration at all times, but those grappling with grief might experience impairment of these skills, whether realized or not. Such symptoms of impaired motor skills might include an inability to focus or concentrate; reduced response time(s) to external stimuli or situations on the road; or unexpected emotional responses behind the wheel, such as tears or sobbing, that physically interfere with our driving ability. Grief is hard work and, as noted above, takes a toll on our bodies. For numerous reasons, including poor eating habits and disrupted sleep patterns, grievers often experience low energy levels, feelings of fatigue, or weakness in their muscles. The stress of losing a loved one to death and the subsequent grief can reduce or suppress your immune system, making you more susceptible to coming down with a cold or catching the flu. In addition, those with an existing chronic health condition might experience a worsening of their symptoms. In addition to the physical effects you might experience when grieving a death, some mourners have also reported experiencing dry mouth, noise sensitivity, trembling or feeling shaky, tightness in the throat or chest, shortness of breath, and increased allergy symptoms. Feeling nervous or anxious often manifests itself in physical ways, such as tapping your fingers, pacing back and forth, fidgetiness, an inability to sit and relax in one place for long, sweaty or clammy hands/feet, or feelings of tingling or numbness in those same extremities. Our bodies are truly miraculous and despite the many advances in science and medicine, we still don't fully understand the marvelous connectedness of the "human machine." We do know, however, that our brains can trigger genuine physical responses to real or imagined things we perceive, such as pain felt in a "phantom limb" after its amputation. Likewise, the experience of grieving a death can induce genuine feelings of pain or discomfort in our bodies, such as headaches or migraines, heaviness in the limbs, aches in the neck, back, or skeletal joints, or overall muscular pain. In addition, one study even found that people already at a high cardiovascular risk might experience an increased risk of a heart attack in the days following the death of a significant person. 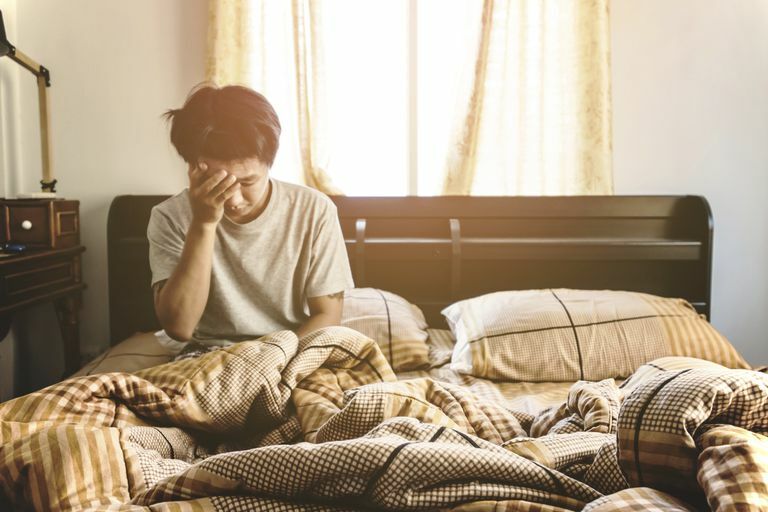 Trouble falling asleep at night or outright insomnia can deprive a grieving individual of the necessary recuperative benefits provided by a good night's sleep. This lack of sleep can affect their appearance, such as creating puffiness in the face or bags/circles under the eyes, among other things. In addition, a lack of adequate sleep due to grief often affects an individual's physical coordination, brain/cognitive functionality and response, and his or her blood pressure. While sleep is an essential daily human function, sleeping for too many hours at a time, or throughout the day, can actually sap your energy and leave you feeling lethargic. Unfortunately, sleeping offers a "refuge" that often helps mourners temporarily escape the pain of grief, so regardless of whether a grieving person naturally sleeps too long or chooses to catch a few more Zzs by taking a nap, many people mourning a death wake up feeling less than refreshed after too many hours. In the days, weeks and months following a death, people often add a few pounds to their normal weight. Among other causes, this might result from a lack of exercise; the grief-induced emotional distraction from their physical well-being and personal care; overeating; eating out more often; increasingly consuming less-healthy foods, such as junk food or fast food; and/or isolation from loved ones who might otherwise encourage healthier or more-regular eating habits. When grieving a death, many people "under eat," fail to eat regular meals, or simply eat nothing at all. Particularly during the first several days or first week(s) following the death, mourners tasked with planning the funeral, memorial and/or interment services might find the myriad of necessary details and decisions—as well as the influx of relatives and friends—distracting and simply find themselves eating when they can, at odd times, or simply "on the go." In addition, weight loss might result from a griever feeling a general lack of energy to cook a meal at home, venture out to a local restaurant, or even make a phone call to order in. Grief often creates an emotional distraction that can create a general feeling of apathy about one's physical well-being and personal care, and/or a sense of isolation from loved ones who might otherwise encourage him or her to eat, provide a meal, or notice the lack of eating and make a comment or do something about it. When coping with grief, it is not uncommon to feel too hot or too cold at various times, even when there's no apparent explanation. Such physical symptoms might include perspiring more than usual, the chills, or night sweats while sleeping. Unfortunately, there is no method to eliminate or avoid the physical effects you might experience after a loss. While difficult and often painful, grief is a normal and necessary response to the death of a loved one, and most people will see a reduction of grief-induced physical effects with the passage of time. If any of the physical effects you're experiencing do not subside in time, or feel unbearable, you should consult your physician or healthcare provider. This is particularly the case for pain or physical discomfort, digestive problems, illness or flu, or if an existing chronic health issue worsens. In addition, the most important way you can help yourself while grieving is to take care of yourself and your needs. Many of the physical effects of grief listed above arise from the failure to listen to our bodies and practice the healthy habits we otherwise might. Here are several important ways grievers can care for themselves. Stay hydrated: Drink plenty of water throughout the day and avoid excessive alcohol consumption, which acts as a diuretic and can actually dehydrate your body. Get exercise: If you regularly exercised before the death of your loved one, then try to continue that routine as much as possible. And if you led a sedentary lifestyle, then consider finding some time to exercise each day, such as taking your dog for a walk, riding your bike or asking a friend to stroll with you in the local park or shopping mall. Even moderate daily exercise can help you sleep better, help work out some muscle stiffness or discomfort, and can often lift your spirits and improve your outlook. Eat properly: As noted above, grievers often find it difficult to have a meal even if they feel like eating. At times like this, consider eating several smaller meals during the day if your schedule interferes with your usual breakfast, lunch and dinner routine. In addition, the foods you consume should consist of healthy, nourishing items rather than fast food or something you purchase from a vending machine. If you lack the time or energy to shop for groceries, consider asking a loved one to visit the market for you. Get rest: While grief typically disrupts our normal sleep patterns, getting proper rest is important. To whatever extent possible, try to develop a regular bedtime routine and schedule; minimize distractions, such as a television, iPad or tablet, or cell phone; and keep your bedroom dark. In addition, try to avoid caffeinated drinks for at least three hours before bedtime. "Risk of Acute Myocardial Infarction after Death of a Significant Person in One's Life: The Determinants of MI Onset Study" by E. Mostofsky, M. Maclure, J.B. Sherwood, et al., 2011.